Free Shipping Included! 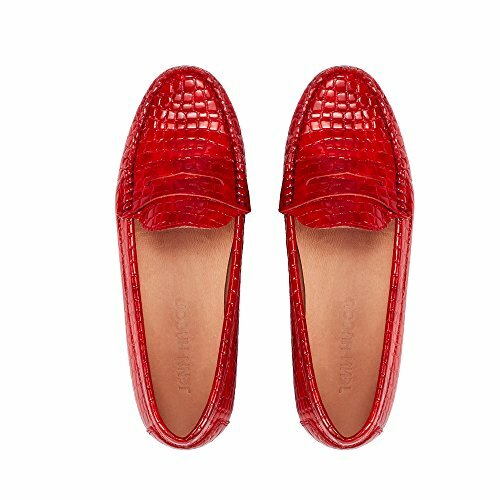 JENN ARDOR Penny Loafers for Women: Vegan Leather Slip-On Comfortable Driving Moccasins Flats by JENN ARDOR at Average Adventures. MPN: JAPCL1802002-RD-41. Hurry! Limited time offer. Offer valid only while supplies last. CLASSIC MOCCASIN FLAT Ladies, we all understand the dilemma between having to be dressed up for work and wanting to be comfortable all day. Ladies, we all understand the dilemma between having to be dressed up for work and wanting to be comfortable all day. Traditional flats may look great for work, but your feet end up in pain by the end of the day. Jenn Ardor classic smoking loafers combine the high end quality of a nice office shoe with the casual comfort of a moccasin. A hot office space or lots of walking throughout the day can leave your feet sore and sweaty, producing a distinct odor from your shoes. Jenn Ardor cushioned shoes not only offer comfy, supportive footbeds, but a breathable lining as well for a shoe your foot will truly enjoy. At Jenn Ardor, we understand that as the supporter for the rest of your body, your feet deserve the best. That's why we created our designer flats with soft exterior leather that is luxuriously smooth to the touch.. Traditional flats usually have cheap bottoms with little to no traction, causing you to slip and slide on icy sidewalks or tiled office floors. Our modern oxford loafers feature comfortable, thick rubber bottoms that offer ultimate traction so you won't lose your footing when walking. Ladies of all ages will fall in love with these classic slip on loafers. Match them with your dress pants and blouse for that meeting with investors or wear them with jeans and a sweater around town for errands. You'll be amazed at their versatility. The shoes run true to size, but if you're unsatisfied with the fit or your purchase for any reason, you may return them within 30 days for a full refund. If you have any questions about this product by JENN ARDOR, contact us by completing and submitting the form below. If you are looking for a specif part number, please include it with your message.